Why did I take this long to read this? From Austen's big six, this is the last I got to. I mean, I know what my reasoning was: satire and humour was not what I was looking for when I searched for an Austen volume. But I was wrong to, because this was a great romp. If you put this and Persuasion together, it's impossible to ignore that the woman's common thread is not romance, but social critique, and tropes and expectations. In this one she takes Gothic literature ones, and more than run with them, runs them over. Anne Brontë kinda did that in a very understated way. There is nothing understated here, and I was laughing from the opening lines alone... Actually, the overall initial setting is quite similar to Brontë's Agnes Grey's opening, just, you know, absolutely savage. Much like the whole book. The charming part comes from Catherine being a sincerely good-natured soul, and pretty sensible on the whole, so even where she hypes herself from much sensational reading (and hell, like nobody ever got jumpy in the night after reading or watching some horror), and builds some weird fantasies on it, she never quite finds herself carried away on over-dramatic feelings of angst, be it romantic or otherwise. Even when other characters ask about them on hilariously detailed, over the top descriptions. 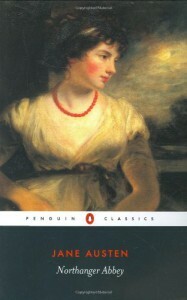 I get now why it is the favourite Austen among many. I had lots of fun with it.